Lee Man-soo, a former triple crown-winning catcher, topped the vote for South Korea’s all-time baseball greats, the nation’s top baseball league announced Monday. In a vote among baseball officials, fans and media, Lee earned 74.05 points of a possible 100, the Korea Baseball Organization said. The league is celebrating its 30th season and naming 10 all-time all-stars as part of the season-long commemoration. Lee made his debut in 1982, the KBO’s inaugural season, with the Samsung Lions and played his entire 16-year career with the team. He hit the KBO’s first-ever home run. In 1984, he became the league’s first triple crown winner as the leader in three major offensive categories ― home runs (23), runs batted in (80) and batting average (.340). Lee, nicknamed “Hulk” for his power, topped the KBO in home runs from 1983 to 1985, and is ranked 10th all-time with 252 dingers. He also served as the bullpen coach for the Chicago White Sox in Major League Baseball from 2000 to 2006. The Sox won the World Series in 2005. 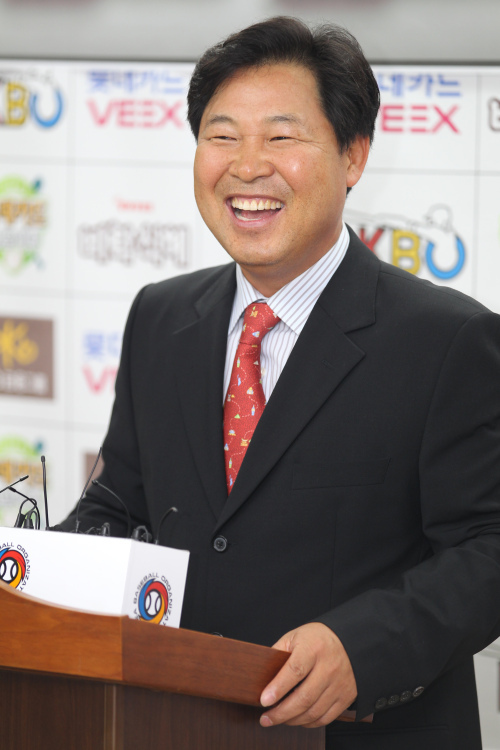 Lee later joined the SK Wyverns in the KBO as a bench coach, and help the team win the Korean Series titles in 2007, 2008 and 2010.